Wendy Moira Angela Darling is quite the name, in fact the name came from a dear friend of novelist, playwright and creator of Peter Pan, J.M. Barrie. Margaret Henley was a five year old girl who would refer to Barrie as her friendy, which she pronounced a fwendy. Sadly, Margaret passed away early in life, but Barrie always remembered her. Wendy has made several Disney appearances alongside Peter Pan. Her debut came with Walt Disney’s 8th film. The 2002 sequel, Return to Neverland, the TV shows House of Mouse, Jake and the Never Land Pirates and the 2008 direct to video, Tinker Bell. Wendy had a rather large role in the first Kingdom Hearts, at first she was mistaken for a Princess and kidnapped by Captain Hook. Most fans consider Wendy and Peter to be an official Disney couple. However, Peter is too young to have much interest in Wendy in that way, and Wendy, being a bit of a romantic, only tries to kiss Peter once. Years later, well after their years in Never Land, Wendy is all grown up, married to a man named, Edward, with children of her own, Jane and Danny. 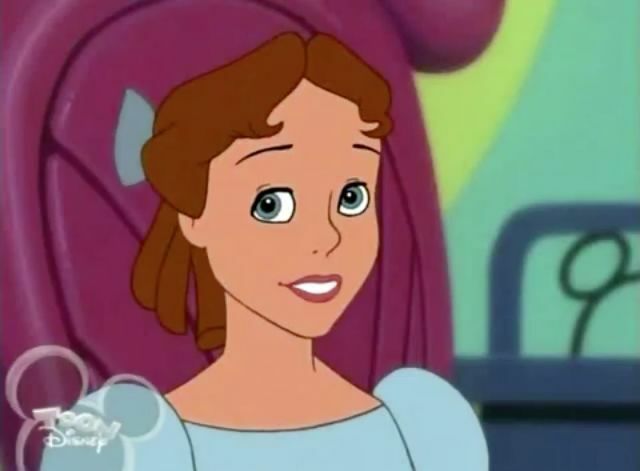 Voice actress and Disney darling Kathryn Beaumont, who had voiced Wendy in 1953, did recordings for adult Wendy in 2002, but for an unknown reason her work was rerecorded by Kath Soucie. Kathryn Beaumont was also the voice for Alice in Alice in Wonderland, as well as the live action reference for the animators. Check out my Instagram for a special kiss. I’ve always felt sorry for girls called Wendy, it not being a real name with any history… but it does have a story of course!